Do you have hormone and/or endocrine imbalances? I do, and boy are they rocking my already rocky ride. Rheumatoid Arthritis is enough of a hot mess to manage, and now I've got all this nonsense going on. Menopause. Damn girl, you are not a fun ride. Add in some thyroid disfunction and exhausted adrenals that have seen decade of stress, and you've got a mucky, mucky mess. Needless to say, I'm doing all I can from a diet and lifestyle stand point to help my body get right with all of this. 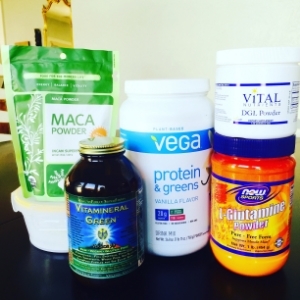 These are my current smoothie supplements to help with my hormone, thyroid, and adrenal imbalances: MACA powder for energy and endocrine balance, Vitamineral Green powder for detox and green nutrient boost, Dr Axe Collagen (in tub) for joint and gut repair, Vega protein, DGL and L-Glutamine powders for gut repair. Adding these to my POTF Green Smoothie every morning. Also using the DGL and L-Glut mixed with aloe between meals, and the collagen in my herbal tea once a day. I'll keep y'all posted. In the meantime, if you've battled these demons yourself, please share what has worked for you in the comments below! Posted on February 5, 2016 by Catherine Ruehle.